Two pairs of B-52H Stratofortress bombers, from Barksdale AFB and from Minot AFB, streaked north last week on a long-range exercise dubbed “Polar Growl.” One set of bombers would end up over the far reaches of the North Sea, while the other would cruise high above the Polar Icecap, both areas where Putin's Russia is increasing its presence. This doesn't seem like a coincidence. Such a statement is somewhat of a slap in the face to the Russians who have become increasingly brazen when it comes to their near constant long-range strategic aircraft drills, even turning off their transponders when flying in dense international airspace. "The long-range nature of the mission, coupled with the opportunity to interact in real-time with allied aircraft was an invaluable experience that simply can't be replicated out of the cockpit... Training like this ensures we are ready to respond to any and all mission directives across the globe." "There are a rare number of opportunities to practice Polar Navigation. The training that the crews received from the Polar Growl mission was invaluable... We continue to update the knowledge base of the crew force through squadron and operation discussions of these events to share experiences and techniques to keep the sword sharp in the many mission sets the B-52 Stratofortress is responsible for." 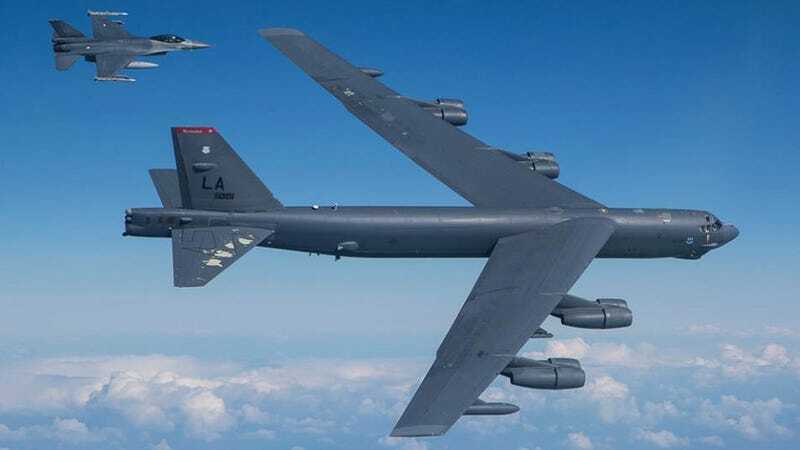 And those "many missions" that he references, along with ever decreasing crew flight hours, may be hindrances to the B-52 force's ability to stay in top readiness condition for their nuclear strike role. The truth is that for the past decade and a half they have been busy bombing the Taliban in Afghanistan from tens of thousands of feet up in the air, employing their Sniper targeting pods, which were designed for fighter aircraft, and laser and GPS guided bombs. This is a very different mission than patrolling the arctic as a deterrent towards potential Russian aggression. Although Polar Growl may not be as incredible a show of force as the USAF softly implies, the locations where these B-52s were sent are areas where Putin's Russia has great interest. Now we will have to see if Polar Growl was just a preview of many more similar missions to come. Seeing as Putin's long-range aviation forces have marauded around the globe with alarming regularity as of late, and the US is already trying to curtail these flights, now it may be time for the USAF to give Russia a little taste of its own medicine.